We were visiting friends for dinner, when one of them turned to me and said, "you know you should have a special place in the blog for all your father's recipe." All my friends know it. My father is a terrific cook. He picked it up a few years ago when he retired and has not looked back. Vegetables, dals, chicken he can and does cook everything, but I think fish is his specialty. 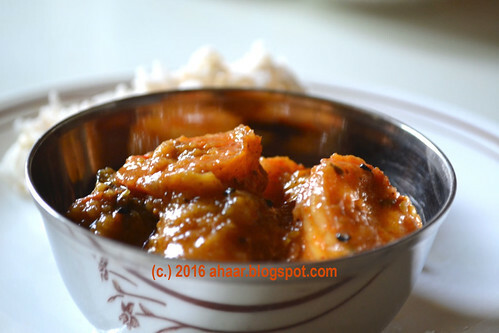 You can look at the the earlier recipes I've posted from his last visits - aloo potol diye chingri macher jhol, or pyanj tomato diye salmoner patla jhol. This time, when my parents came I asked him what recipe he had in mind for chingri mach this time. He said he was going to make it with eggplants. The Ann Arbor Farmer's Market has had a bumper of eggplants. Every week, for one dollar, I get a big, fresh eggplant that we then use for bharta, beguni or in macher jhol among other recipes. So coming back to a special place. I hesitated as his and my mother's influence is in a lot of my cooking. It's little things I have picked up over the years. It may not be his recipe, but it may have some thing that I may have learned from him. Plus, I have learned my lesson with Aswin's corner. It's not just a corner, it's us. So instead of a place, I let it permeate the overall blog as it already does. This year Ganesh Chathurthi coincided with long weekend in the US. We planned on making a big feast for Ganesha which included idlis, payesam and modaks. While the first two were easy to make (have experience doing it) the third was a little tricky. Modaks are sweet, steamed dumplings that are made especially for this festival. The few times I made modals was with my MIL. This time she was not here. So Aswin called her and she gave him the recipe for the filling. For the modak rice outer covers, he looked up a website (vegrecipesofindia) for making the rice flour dough. When I started making the dough, I was at a loss. The recipe proportions were vague and the steps were not clear. And I ended with this gooey mess. Time was running out. That's when I remembered Saee Khandekar, another food blogger from my early days of blogging. 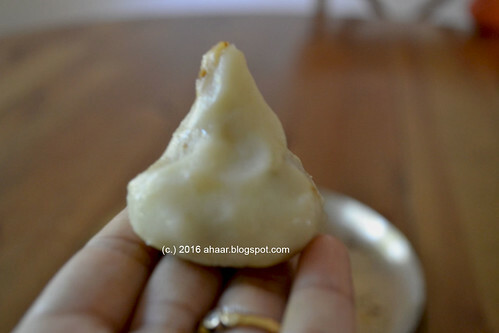 She is an expert Maharashtrian cook (check out My Jhola ) so I quickly looked up to see if she had a modak recipe. She did! I did a mental hallelujah and set about making a second batch of rice dough. With her specific instructions like this, you know you cannot go wrong. At the slightest hint of rebellion, stir in the rice flour. Don’t worry about the dryness yet. Remove pan from heat and stir continuously. 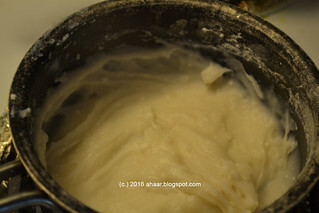 Cover and place back on heat for a minute or two, until the mixture doesn’t smell powdery. So thank you Saee, the proportions and the descriptions helped. We had fun making the modaks for neivedyam (offerings to Ganesha) and then eating it. The modaks were nowhere as beautiful as hers, but it was fun sharing this activity with the little ones. We will surely be making modaks again.